Are you aware of your brain? Our article on the research has sparked interest from other researchers, and the media. Here are some of the questions we’ve been asked. Thanks to the team, Peter Aspinall, Panos Mavros, and Jenny Roe, for providing answers. How did the idea for the study come about? It involved a meeting of different interests. The (i) Edinburgh School of Architecture and Landscape Architecture in the University of Edinburgh and the (ii) School of the Built Environment at Heriot Watt University wanted to work more closely together to address broader environmental issues than either could handle independently. Richard Coyne and Panos Mavros at the University of Edinburgh had a distinctly architectural and cultural focus, intrigued by the concept of emotional mapping, particularly as championed by the art movement known as the Situationist International in the 1960s. Jenny Roe and Peter Aspinall were interested in better outdoor environments, and the restorative health benefits of natural and built environments. What are the most significant findings of the study? There are many self-reported benefits of the positive effect of nature on health, but little that is based on independent and repeatable evidence. This study contributes to the pool of such evidence. The most valuable finding is that this study confirms (via EEG) the health benefits of nature and restorative theory, which stipulates natural settings allow recovery from attention fatigue. The study is also pioneering in establishing a method for mapping how the brain responds to different urban settings. Who invented the portable EEG? How were the participants of the study chosen? These were mainly from amongst the body of students at the University of Edinburgh. What reaction are you hoping to get from the study? eg. used by campaigners against developments on green space sites? We are strong advocates for green space, but our focus is design rather than campaigning. It may be the case that similar restorative benefits can accrue from the design of architectural environments that have some of the characteristics of open green space. This needs to be tested. The project proved to be a very effective pilot study to enable further research and more thorough investigation into the design of better environments. What is the exact route of the walk? 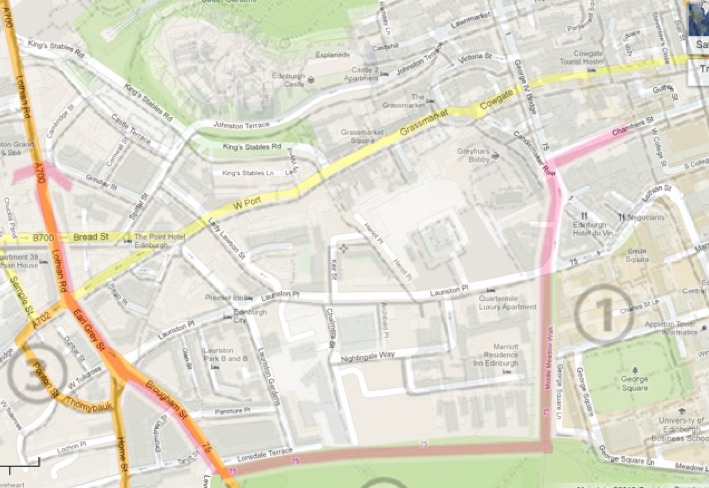 Here is the route of the walk overlaid on a Google map, with street names. What does the EEG data look like? The following graph shows the rise and fall in the EPOC “frustration” parameter of just one of the participants over the course of the walk. 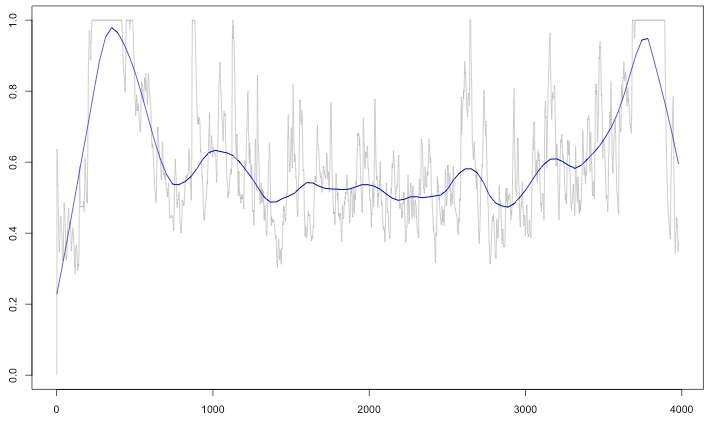 The thicker line shows the data smoothed. The full data fluctuations were used in the statistical analysis. Note that this is not a graph of EEG signals, but rather a graph of affective states as calculated by the Emotiv “Affectiv Suite” software, which translates brainwaves (EEG) into states characterised with emotional descriptors. In fact, emotion detection from EEG and other psychophysiological measures is still an ongoing project and there are different approaches and opinions amongst neuroscientists. Epoc’s translation algorithm derives from training sets of human participants whose neural patterns were matched via machine learning techniques to the several emotional states defined in the “Affectiv Suite” (from conversation with Emotiv’s CTO) [sentence added 25/8/2013]. Why did you select the method of statistical data analysis you used? Though the data for the particular component and the particular participant indicated above seems to support the hypothesis via visual inspection alone, this is not the case for all the data for all participants and for the data combined. As we say in the paper, we adopted a form of high dimensional correlated component regression analysis with M-fold cross-validation, which is excellent at detecting significant patterns in such data. What alternative interpretations could be placed on the data and results? We have clearly demonstrated that a mobile EEG can detect changes while people are walking in different environments, and this is an important contribution. More follow up studies are needed to strengthen the claim that greenspace is responsible for the shift towards lower arousal and higher meditation. It’s possible that a general adaptation to the walk (not the rhythm of walking itself) coincided with the crucial drop in arousal during the greenspace zone. Our recent findings of high intercorrelations between the EEG signals indicate this would automatically be associated with an increase in meditation. Therefore it is possible that any adaptive changes after 10 minutes into a walk may bring about the key outcomes in the second zone whatever the environment. There were no significant shifts back to higher arousal (or lower meditation) as people moved into zone 3. This might also be due to there being no further adaptive shifts as the walk progressed. How sure are you that the effect you recorded is not due to other features of the walking experience, rather than moving into and out of green space? Our experimental data confirms the EEG changes are not a function of walking, and contains its own promising conclusions in the direction of the initial hypothesis. 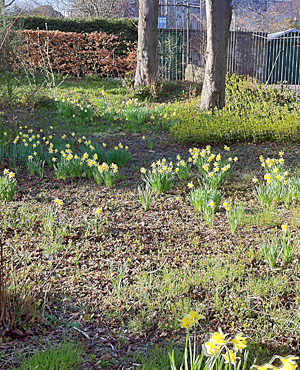 What further research is necessary to strengthen the greenspace argument? We could either take participants in and out of green zones in different sequences during the duration of a walk, or adopt an even simpler design. Two groups set out on a walk together. Then at 10 minutes into the walk one group moves into greenspace and another group stays in the same urban environment or returns back to base. Where will you take the research next? We now have funding for a major project developing this research further as a 3-year study with older people. We will continue our EEG work as a workpackage within this bigger study. The new project is entitled: Mobility, Mood and Place: a user-centred approach to design of built environments to make mobility easy, enjoyable and meaningful for older people This is a collaborative project supported by the EPSRC/AHRC/SRC/MRC scheme Design for wellbeing, Ageing and mobility in the built environment (EP/K037404/1), involving experts in architecture, landscape architecture, epidemiology, clinical sciences, psychology, gerontology and neuroscience. The EEG component is just one part of this bigger study, involving design workshops, and longitudinal studies of older people in the Lothian Birth Cohort. In future research we need access to the raw EEG data and sharper definitions of the 5 EEG parameters provided by EPOC. Do you welcome input from other researchers? We very much welcome this. We hope that others will contribute to the further testing of our results, offer advice and share knowledge in this increasingly interdisciplinary area of research. How does “taking a break” work? How does “down time” affect busy lifestyles? Does it balance out stress and anxiety? A short break in a natural setting will help facilitate reflection and recovery for anyone experiencing stress or fatigue, such as a young parent with an infant in a small flat, or someone experiencing a stressful situation at work or home. What’s the recommended amount of time span for these breaks? Our study showed walking for even a short time in green space (around 10 mins approached from a busy urban street) had a restorative effect (increased meditation, reduced arousal). But we need much more research on time thresholds and the context of them. What are some of the best ways to get these restorative benefits if you have a tight schedule that keeps you glued to your desk or work? Our research and that of others, along with anecdotal evidence, indicates that even short break from your desk at work will help reduce symptoms of stress and fatigue, and even anger and depression. Such breaks could include a 10 min walk in a nearby green space, sitting in a work atrium or courtyard, or simply looking at a view of green space from your window. However, there’s still a lot of research to be done looking at the effect of green space on work stress. It’s an area we hope to develop. What’s a good, alternative solution for those who can’t necessarily make it outside during the work day? 10 minutes mediation somewhere quiet, or a short walk around about or talking to a colleague, some social interaction, will all help. What we need is more micro green spaces in the office: roof gardens, interior courtyards etc. Do you have any additional advice or suggestions on reducing brain fatigue with nature? Why is this important for their health? A study we did in Scotland has shown has shown greater levels of green space are associated with less physiological stress – as indicated by a healthier diurnal pattern of cortisol – the stress hormone secreted in the adrenal glands. So green space could be acting as an important buffer to stress and help nurture resilience to the negative effects of stress e.g. cardio-vascular disease. Also see blog posts The brain in the city, Soft fascination, Synaesthesia anaesthesia, Posh boys and mirror neurons, Exaggeration, Arboreal architecture gets wrong end of the stick, and Neuroscience eclipses AI, and Brain scans and creativity. One correspondent said about our study: “As if we needed a study to tell us that a walk in the park or any other nature space away from the din of the city would help chill out and calm the brain!” Behind this is the question: doesn’t psychological research just tell us what we know already? There’s a helpful response to this general question in a short article (with references) by Tom Stafford “… the purpose of psychological science is making findings about the human mind and behaviour available – obvious! – to everyone. By explicitly, rigorously, stating propositions about psychology and laying them open to testing we are democratising knowledge. We are making knowledge public, explicit and usable by everyone. That means stating the obvious, so that anyone can come and disagree with it (and so that we can be sure we aren’t deluding ourselves about what is true or what we know)” (p.95). Alexiou, K., T. Zamenopoulos, J. H. Johnson, and S. J. Gilbert. 2009. Exploring the neurological basis of design cognition using brain imaging: some preliminary results. Design Studies, (30) 6, 624-647. Hansen, Susan. 2007. Counter point — Going the proverbial extra mile. The Psychologist, (20) 4, 210-211. Online. Stafford, Tom. 2007. Isn’t it all just obvious. The Psychologist, (20) 2, 94-95. Online. This is such an exciting project and articles! I’ll get in touch with you and your colleagues to discuss some thoughts on possible future collaborative projects. We were discussing some relevant ideas with our colleague Dr. Sarah Owen; we are setting up a journey in a physical environment and the same in a hybrid/virtual environment (i can tell you more details on that) and monitor the participants brain activity in each. One of our questions is to examine the similarities/ differences between the two environments. I’ll send you more info and I’ll be looking forward to your – always extremely valuable – feedback. Thanks Anastasia. I look forward to hearing more from you and Sarah. It basically covers three areas, why healing outdoors is important, the kind of spaces that should be designed and how to go about it. While it tends to dive more into landscape architecture around buildings and parking lots, it also focuses on the use of windows and how to design something around a need for nature.